The LaurenHill Academy Dance Department started in 1983, by two teachers, Vikki Myrianthis and Francine Lacroix, in a classroom of the then St. Laurent High School and was meant to be a lunch dance club. 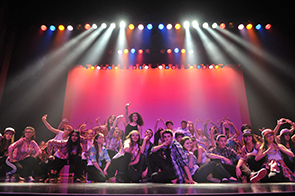 Over two decades later it has evolved into a unique dance program not only within our School Board but also within the whole province of Quebec. The dance program has two goals: firstly, to instill the discipline and commitment required to become a good dancer; and secondly, to foster a lifetime appreciation for the arts. Céline joined our team in 1993 as the modern dance specialist of the after school program. She has successfully completed a baccalaureate, focus in dance teaching at UQAM. She is a graduate of “Les Ateliers de Danse Moderne de Montréal Inc” which is a full-time, three year program whose goal is to train dancers, choreographers and interpreters of modern dance. Before LaurenHill, she was teaching full time at “Concentration-danse de l’école secondaire A.N. Morin” for three years. Since 1999, she has taught in the day program of LaurenHill Academy as a full time teacher. Céline is presently teaching grade 9,10 and 11 dance classes. She is also directing the after school dance program as well as producing this year’s end concert. Passionate of all artistic mediums, Melissa Spensieri finds her voice through the art and love of dance. She started her training at a young age of 3 years old in ballet jazz and tap. Upon request from her studio’s director, she entered the competition circuit at the age of 9. She began teaching at 15 years old at Ecole de Danse Johanne Marchand, where she remained part of the team for 7 years. Her experiences eventually led her to open her own place in 2008 named Ecole de danse Prestige where she teaches jazz, lyrical, tap, and hip hop. During those years she also led workshops in many CEGEPs and choreographed for troupes in and around Montreal. Furthermore, she is a member of the DancEvolution hip hop competition circuit. As a member, she judges a number of hip hop competitions a year. Having begun her training young allowed her to try out many different styles, including the Latin dances, classical ballet, house, waaking and many more. Her ability to quickly adapt to the attitudes and ways of movement of each dance style is what has made her a well-rounded dancer. Nowadays, she continues to train 7-1o hours a week at Prestige, all the while taking classes wherever she can, having attended some in Paris and New York City. She is excited to see what the future holds for her and for her students, for nothing makes her happier than seeing her students shine! Kristian Dalisay is a professional dancer and choreographer originally from Toronto. He has quickly made a name for him self working with Canadian stars such as Danny Fernandes, Anjulie, and Victoria Duffield, while opening for headliners such as Sean Paul and Down With Webster to name a few. Moreover, Kristian has performed on some of the largest Canadian stages including the MMVA’s, CityTV NYE Bash, America's Next Top Model, and Z103.5 Summer Rush Tour. Kristian has also been featured in several music videos and fortunate to be the lead in Victoria Duffield's- Feel working under Luther Brown. Although he currently resides on Montreal, Kristian is apart the diverse Artists In Motion Dance Company as well as the all male crew called The Original Gentlemen. Kristian's teaching experience also varies from city to city. He has taught at numerous studios in the GTA, Kingston, Cornwall, and Thunder Bay where he works with At Risk Youth in a Native Reserve. Kristian’s most recent accomplishment was his completion in the Motivating Excellence Montreal Intensive program, where he was trained by Rhapsody James. Gama Fonseca has a Mexican nationality and was educated in Dance Therapy and Design Choreography at the Centro Univesitario de la Danza in Mexico City. To complete his artistic training he joined different styles and dance techniques as: Break dance, Traditional African dance, Afro-contemporary, Gum Boots, Afro Cuban, capoeira, Brazilian and Afro Latin dances; always seeking the versatility that makes creating a unique style and a particular quality of movements. His professional work began in Mexico with contemporary, jazz and urban dance companies such as: Zapar productions, Agave Azul, Caverna 7, Mauricio Rendon Company, Boss productions, Studio 3 and various television shows for TV Azteca and Televisa. Since arriving in Montreal, he worked for various companies as: Destinies Croises, Cirque Éloize, Cirque du Soleil, the Montreal Opera (Aida, Starmania Rusalka), Just for Laugh Festival, Les sortileges Dances du Monde, RUBBERBANDance, Triba African Dance, Group Bazz and Nyata Nyata for African contemporary. He has performed out in various artistic tours both nationally and internationally. Amalia began dancing in elementary school and later pursued classical ballet alongside Danielle Berubé. After numerous years of ballet, Amalia selected LaurenHill Academy specifically for the incredible dance program. Here, she was a member of the Oui Dance Troupe and took many after-school dance classes in various styles. It is at LHA that Amalia discovered her interest in Baladi. Upon graduation, she continued to take classes in the genre and represented McGill University during a Bellydance Conference. Amalia continues to be highly involved with the LHA dance program and with the Oui Dance Troupe. With more than 25 years of dance experience, Amanda grew up dancing in the Ville Saint-Laurent area. Her early dance education at Les Amis de la Danse focused mostly on classical ballet, tap and jazz but when she started teaching at the age of 16, she expanded into hip hop as well. In 2004, she became a founding member and co-choreographer for the Montreal amateur dance troupe Showtimenow, where she stayed for 3 years. As of 2008, she opened up her own dance studio in Laval called Ecole de danse Prestige where she continues to teach jazz, tap, lyrical, hip hop and cardio fitness classes. Throughout the last 15 years, Amanda has enthusiastically pursued her dance training by participating in various workshops, fundraisers and competitions across Quebec and New York State. She even auditioned for the first edition of “So You Think You Can Dance Canada”. A lover of all things rhythmic, she is looking especially forward to sharing and exploring her passion for tap with the students of Lauren Hill Academy. Cara Roy is a professional, Montréal based dancer, originally from New Brunswick. In 2016, she completed l’École de Danse Contemporaine de Montréal’s three year program, where she had the opportunity of working with many influential choreographers such as Peter Jasko, Catherine Gaudet, Manon Oligny, Marie Béland, Sasha Ivanochko, Virginie Brunel and Jamie Wright. Since then, she has presented many personal and collective projects, and has as joined Production Scala’s creation process with choreographer Hélène Remoué, performing across Québec in 2016-2017. Wanting to feed her desire to share and her love of teaching, Cara has lead many classes and workshops independently throughout her year at EDCMTL. Creating workshops focused on contemporary movement techniques and anatomy for dancers, she has offered many classes at Artemis Dance Studios (Fredericton, NB). She has also acted as training instructor, contemporary dance teacher and choreographer for the summer dance intensives offered by the school.